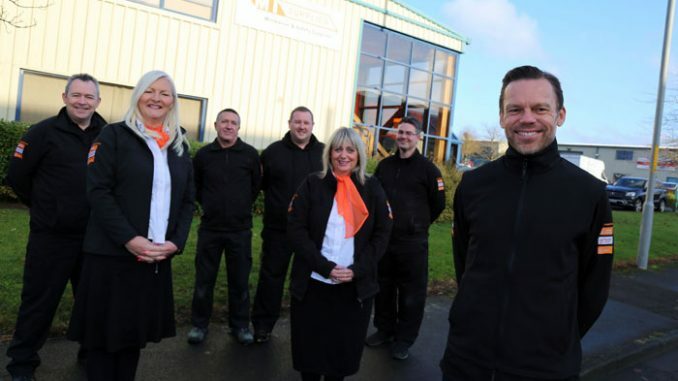 A Teesside workwear supplies business is set for a 13th consecutive record year of sales – and that’s after losing a £2.4m contract. MI Supplies, based at Teesside Industrial Estate in Thornaby, was dealt a blow earlier this year after being told their largest customer wasn’t renewing a three-year deal worth £800,000 annually. But a surge in online sales means the firm, founded by managing director Alex Ingham in 2005, is still set for its best year yet, with turnover set to hit £3m by the end of 2018, up from £2.35m in 2017. Rather than focusing on the negatives of such a big contract loss, Ingham says it has been a valuable lesson, with MI Supplies now in a stronger position to hit an ambitious target of reaching £10m turnover by 2020. “At one point a few years ago this contract made up about 70-80% of our business, so we put a lot of plans in place five years ago to get it to under a third of the business,” said Ingham, pictured above (right) with his management team (left to right) business manager Russ Lock, accounts manager Sue Blythman, warehouse supervisor Bill Watson, stock manager Gary Devlin, admin manager Sheryl Butters and web manager Neil Shepherd. “Now we’ve managed to do that, it isn’t as much of an impact and, in fact, I think has worked in our favour. Website sales have already taken up the slack of the loss, and online sales should hit our target of £2m per annum this year. MI Supplies has in recent months put a new management structure in place, including business manager Russ Lock, accounts manager Sue Blythman, warehouse supervisor Bill Watson, stock manager Gary Devlin, admin manager Sheryl Butters and web manager Neil Shepherd. The firm is enjoying online year-on-year growth of 110%, and during the recent Black Friday weekend doubled last year’s figures, with 440 orders totalling £34,430 over the three days. Ingham added: “It almost feels like we’re starting as a new business, with a new lease of life, but with a standing start of £3m-a-year in sales and a good infrastructure in place. “We’ve done a lot of work online, plus re-designing our site. We’re now the biggest Carhartt dealer in the UK, and a few other brands we’re in the top five UK suppliers. “We have a stronger management structure so we now have people in all the key positions, which means the majority of things don’t need to flow through me now. “We’ve installed a new bespoke high-speed broadband system which means our internet is now 40 times faster, which will speed things up in terms of processing sales and accommodate a new automated scanning-picking system, which we think will gain us an extra 60 hours a week. MI Supplies is already one of the UK’s biggest suppliers of brands such as Carhartt, Snickers, CAT and Portwest and is looking to add to its high-end brand portfolio. The firm launched in 2005, which moved from 3,000 sq ft units to a new 8,000 sq ft unit at Willows Court on Teesside Industrial Estate in February 2015, now has a growing client base consisting of more than 250 business customers including the fire brigade, local councils, engineering firms and charities, and have supplied over 130,000 orders to clients worldwide.